While many home buyers are out in the market seeking for bargain deals, the affluent class of property buyers, mostly foreigners, continued to splash cash on Singapore’s luxury condominium segment, mainly for those with a price tag of S$10 million and above. 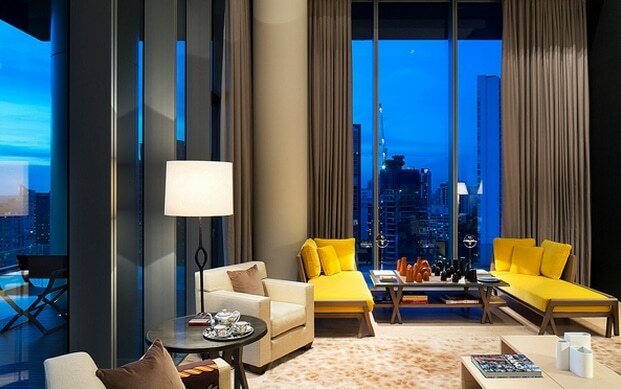 Earlier in April, we’ve seen Sun Tongyu, co-founder of Alibaba, paid a staggering S$51 million for a single penthouse (13,875 sqft) at Le Nouvel Ardmore, a freehold luxury development by Wing Tai Holdings Limited, which is situated in prime District 10 of Singapore. Other than Mr Sun, many other corporate big guns also had their fair share in purchasing high-end condominiums in Singapore this year. One of them is Mr Mahesh Buxani – a businessman who runs M Bux International in Hong Kong, splashed out S$22.5 million for an extravagance penthouse unit (estimated size of close to 6,900 sqft) at Nassim Park Residences. The deal was picked up in the resale market and was also concluded in April this year. At Marina Bay Suites, a penthouse with an estimated size of nearly 4,700 sqft was said to be bought by a regional executive from Facebook, at a hefty price tag of approximately S$11.3 miilion, which works out to be a little more than S$2,400 per square foot (psf). In the same development, another bigger double-storey penthouse (estimated 8,500 sqft) was bought by a Chinese citizen for about S$19.5 miilion (S$2,290 psf). Apparently both buyers for these units are Singapore Permanent Residents (SPR). Another transaction came from Chinese national who also purchased a 3,520 sqft unit at Corals at Keppel Bay in April for a price of S$10.42 million. This was new launch condo purchased directly from Keppel Land, who are the developers of this project. The buyers for both Marina Bay Suites and Corals at Keppel Bay doesn’t seem to be deterred by the leasehold status of these properties, and despite the lease terms are left with about 91 years. Not forgetting activities in prime Orchard Road, which is Singapore’s biggest shopping and entertainment district, it was understood that 2 Iranians have picked up an approximately 4,500 sqft residential unit at Boulevard Vue directly from the developer, Far East Organisation. The unit was transacted at S$15 million just a few months ago. In January this year, a Taiwanese have acquired a 6,663 sqft penthouse unit at Paterson Suites for S$13.9 million. It was understood that the buyer is also a SPR and this was the last unit in the development, which was completed in 2010. In fact, it’s not entirely a “foreigners’ affair”. A couple of Singaporeans have also been picking up high-end condominiums this year. The highlight of all came from the acquisition of a penthouse unit at St Regis Residences for S$12.2 million. It was being bought by the owner of Yun Nam Hair Care, Mr Andy Chua. Not only Mr Chua got a unit there, Blackstone’s current global executive adviser, Mr Harish Manwani (who is an India-borned Singapore citizen) have forked out S$11.8 million for a 5,543 sqft residential unit in the same development. It was mentioned by Mr Alan Cheong, research head of Savills Singapore, that wealthy property buyers are fascinated by Singapore’s high-end property market. When looking the highest recorded property transactions around the world, Singapore seems to be a more obvious option. For instance, a 4,664 penthouse unit in Hong Kong’s Conduit Road was transacted in April for a stunning amount of HK$92,857 psf (S$15,800 psf), where the highest transaction done in Singapore this year in 2015 was only by Mr Sun’s purchase at Le Nouvel Ardmore, which was only $3,676 psf. That’s 76.7% lower than Hong Kong’s. It was noted by Mr Cheong that the property on Conduit Road, Hong Kong has lease-term of less than 50 years, whereas Le Nouvel Ardmore is freehold. When comparing to London‘s property market, it was mentioned that a luxurious penthouse unit at One Hyde Park was sold for an astonishing £140 million in 2014. That works out to be an approximate £8,750 psf (S$18,462 psf). Apparently in the same year, the highest transacted price in Singapore was only S$4,626 psf, which was for a residential unit at Reignwood Hamilton Scotts, with a size of 2,755 sqft. Figures have shown that even in 2014, the highest psf price acheived in Singapore was only 25% of what was transacted at One Hyde Park, London. Even if we were to use Singapore’s historical high psf price of S$6,840 which was transacted in November 2011 for a unit at The Marq on Paterson Hill, it is still significantly much lower than those mentioned for Conduit Road, Hong Kong and One Hyde Park, London. Thus, it probably doesn’t require much consideration from these wealthy property buyers see the attractiveness and value n Singapore’s luxury property market.